My favorite souvenir so far. I got a whole new sense of the caliber of my Berlin rowing club yesterday. All those wooden gig boats and their casual steady state rows threw me for a loop. They did not prepare me for how accomplished this club really is. Yesterday afternoon the club held a club-wide regatta on the Wannsee. I could have just showed up in the morning for a casual 17 km. row, but I decided instead to check out the regatta and see what it was like. 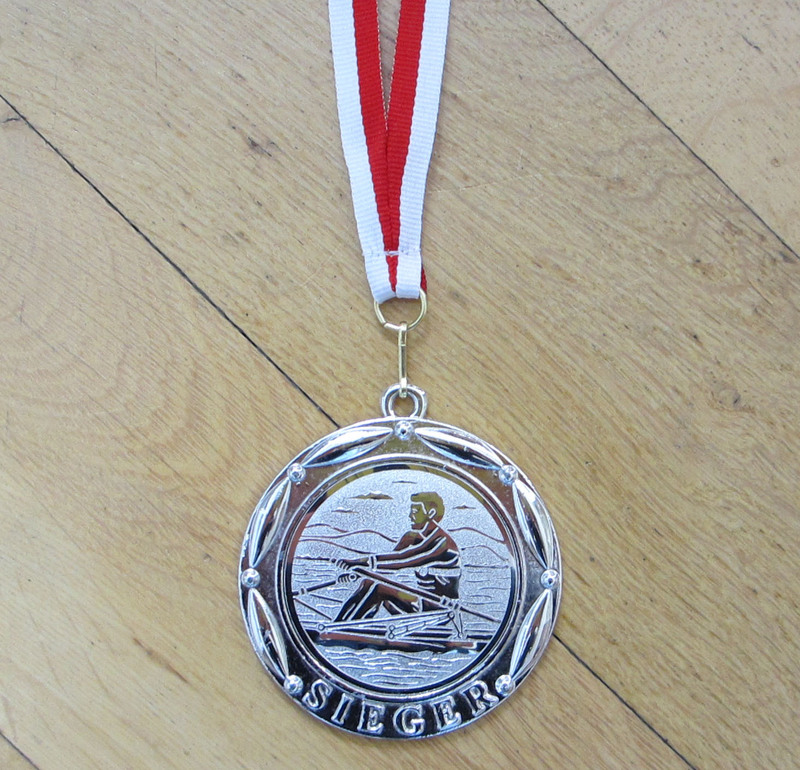 Only rowers from their club could participate. All races would be 500 meters. They had buoys strung up for the three lanes of the course, and you raced toward shore where the rest of the club was watching. For anyone who doesn’t row, 500 meters is a very short race. It’s basically an all-out sprint for about or under two minutes. More typical sprint races are 2000 meters in the spring, or longer ~5000 meter head races in the fall. I arrived at 2:30 p.m., worried I was late for the 3 p.m. start, but it turned out I wouldn’t be racing until late in the day. I was sitting on the patio with my new friend Anne watching the activity below. We had rowed a quad together the week before, and we hit it off. We were at a table with two young men I hadn’t met before. In an aside to me, she mentioned that these two men had each won medals at the World Cup rowing championships, one of them just two weeks ago in South Korea. They were looking at the regatta schedule and noticed that there was only one boat scheduled for the mixed quad race, which without an opponent would have to scratch. Anne suggested, jokingly, that the four of us enter it. To my great surprise, her friends agreed. She looked at me, and I shrugged and said, “Of course!” And she and one of the men disappeared and entered our names. And the afternoon started to look a whole lot different. When there was a lull, I asked Anne what kind of racing start I should anticipate. She told me the typical start was ¾, ½, ¾, lengthen, lengthen – just what we do back home. I was relieved. After a couple of casual conversations like this one, I found myself in three races that afternoon: the mixed quad, a mixed eight, and a women’s eight. They were all pretty much back to back from 5:30 to 6:30 p.m. The mixed quad was my first race. Rowing just over 500 meters up to the start hardly warms you up. We practiced a five-stroke start but that was it other than rowing up to the start. And when the official called Attention, Go!, we took off, flying down that course. I don’t know about Anne, but I was hanging on for dear life, praying not to catch a crab, and just trying to keep my oars wherever theirs were. The stroke rating was at least a 45, but it could have been higher. It felt like it never dropped – in such a short sprint, there was no settle. We flew, FLEW down that course. The winning time was 1:37. And, here’s the part that really gets me, it wasn’t ours. We lost. The other boat, one I hadn’t paid much attention to, took an early lead of about 2 seconds and held onto it. One of the women, about two inches shorter than me, is tougher than anything, Anne had said, and she’s been winning races all over Germany. And her quad had been rowing together all summer. Their win, more than anything else, gave me a sense of how incredibly talented this club must be, because wouldn’t you have assumed that a boat with two World Cup champs would win that race, assuming their teammates were keeping pace and not getting in the way? Do you know what German teammates do when they lose a race? They cheer for the other team. The stroke of the losing boat calls out “Hip hip!” and the rest of the boat calls out “Hurrah!” And again. And a third time. It’s really rather sweet. MRC friends, take note – here’s a great model for a club-wide sprint race. They had judges, launches that followed each race, announcers on shore who told you over the PA system who was rowing in every boat for every race. Everyone was wearing their club clothing. There was a DJ playing music the whole time. Food and drinks were served under tents. They started at 3 p.m. and the last race was at 6:30 p.m., exactly as scheduled, and they presented medals to the winners afterwards, and then we all drank BEER. The woman who presented the medals is, herself, a highly decorated rower. She won a silver medal at the 2012 London Olympics with her women’s quad. An official announced the winners, who climbed the stairs and stood in front of everyone assembled, and then he shook everyone’s hands, after which Julia, the Olympian, congratulated each one, shook your hand, and put a medal over your head. Fun!! Both the mixed eight and the women’s eight were a chance to meet more women around my age who love to row. They were very friendly and accommodating, giving me shorthand explanations in English for whatever was going on around us. And they encouraged me to come Tuesday evenings to join their women’s eight. This entry was posted in Rowing and tagged Berlin, mixed quad, regatta, Rowing club, Wannsee on September 15, 2013 by Jill M..
what an incredible achievement and story, Jill! Hip Hip! Hurrah! Thanks a lot, Stacy and Merie.